Working together to open the doors of education for girls around the world. To educate a girl is to build a healthier family, a stronger community, and a brighter future. Unfortunately today, more than 62 million girls around the world are not in school—half of whom are adolescents. We know that countries with more girls in secondary school tend to have lower maternal mortality rates, lower infant mortality rates, lower rates of HIV/AIDS, and better child nutrition. But too often, a girl who could change her world for the better is locked out of that future by the circumstances of her birth or the customs of her community and country. We know that a girl with an education can shape her own destiny, lift up her family, and transform her community. That is why President Obama and First Lady Michelle Obama launched Let Girls Learn, a U.S. government initiative aimed at helping adolescent girls attain a quality education that empowers them to reach their full potential. 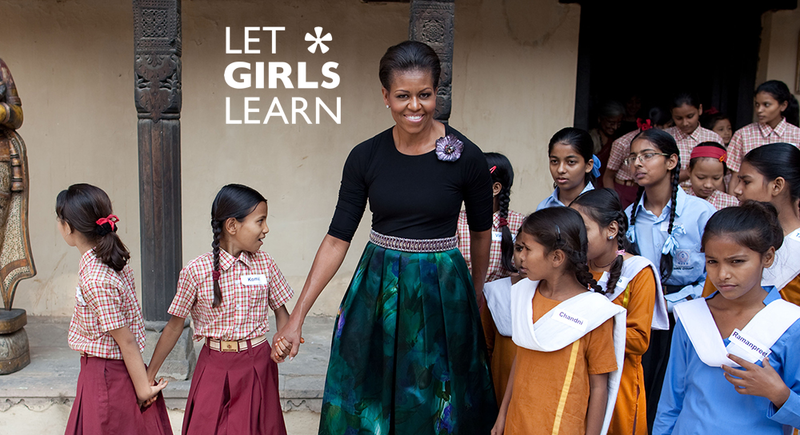 Learn more and how you can take action at letgirlslearn.gov.